Learn how to make quick and easy Halloween pudding cups with simple ingredients for kids Halloween party. Make Ghost, Jack O’Lantern, Frankenstein, Monster. You have probably seen these spooky Halloween pudding cups before. For me, they hold a special spot in my heart because my Mom would make these every single Halloween. This year, I will be making these for my son just so I can continue the tradition. We will be making four simple designs: Jack O’Lantern, Frankenstein, One-eyed monster and a Ghost! They are quick and easy to make with store-bought supplies and ingredients. You can also get very creative with your designs. Kids love this at Halloween parties and even monster birthday parties. You can have them design their own or make it with them. How to make pudding cups? Pour them in plastic containers that have been designed with Sharpie marker. Add final details with pretzels, candies and cookies and you are done. Use store-bought pudding because it’s so much faster. Some of them are already pre-colored and flavored too. Only use gel coloring to color pudding because the liquid coloring can make the consistency of the pudding thinner. Any garnish that’s added to the pudding cups like pretzels, mint leaves e.t.c. should be done just prior to serving to prevent them becoming soggy or limp. Use small disposable plastic cups so they can be thrown out after kids are done eating them and it’s also less clean-up and dishwashing. Use sharpie markers to decorate only the “outside” of the cups because the marker ink is obviously non-edible. Learn how to make quick and easy Halloween pudding cups with simple ingredients for kids Halloween party. Make Ghost, Jack O'Lantern, Frankenstein, Monster. 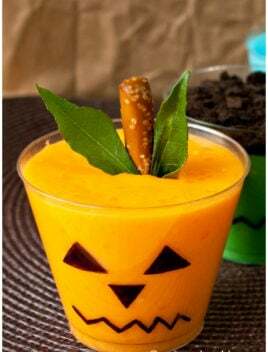 For the Jack O'Lantern pudding cup, use a black sharpie marker to draw two triangle eyes, an upside down triangle nose and a zig-zag line for the mouth on a plastic cup. 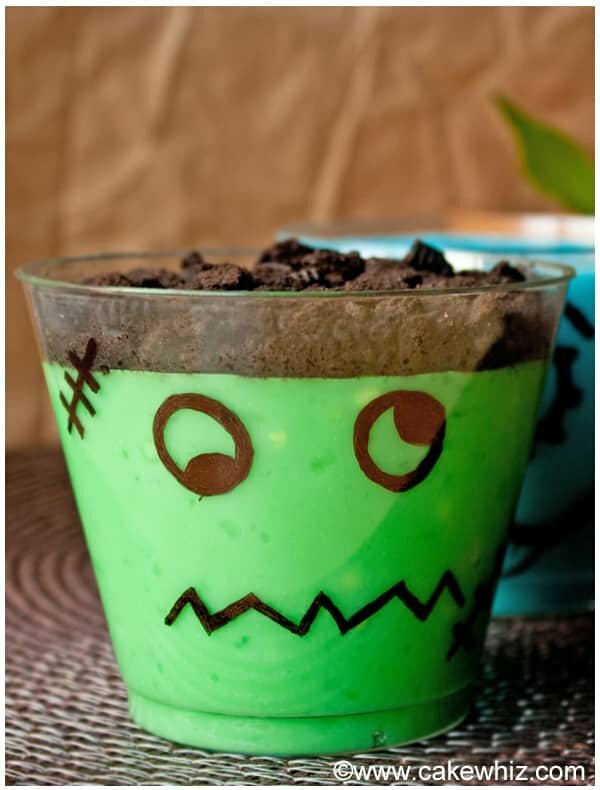 For the Frankenstein pudding cup, use a black sharpie marker draw out two "googly" eyes, a zig-zag line for a mouth and a few stitch marks here on a plastic cup. 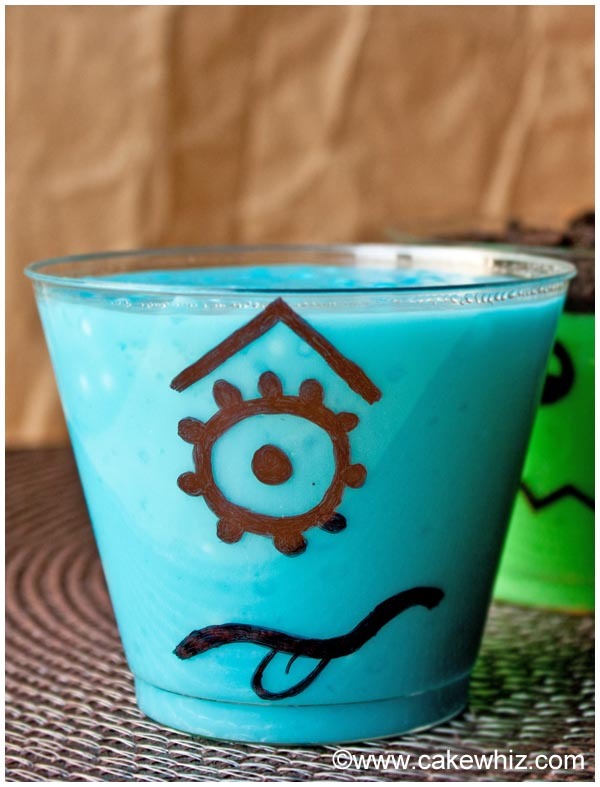 To make the monster pudding cup, use a black sharpie marker to draw one round eye with little dots around it on a plastic cup. Also, draw a triangular arch for the eyebrow and a wavy line for the mouth and even a little tongue, if you like. 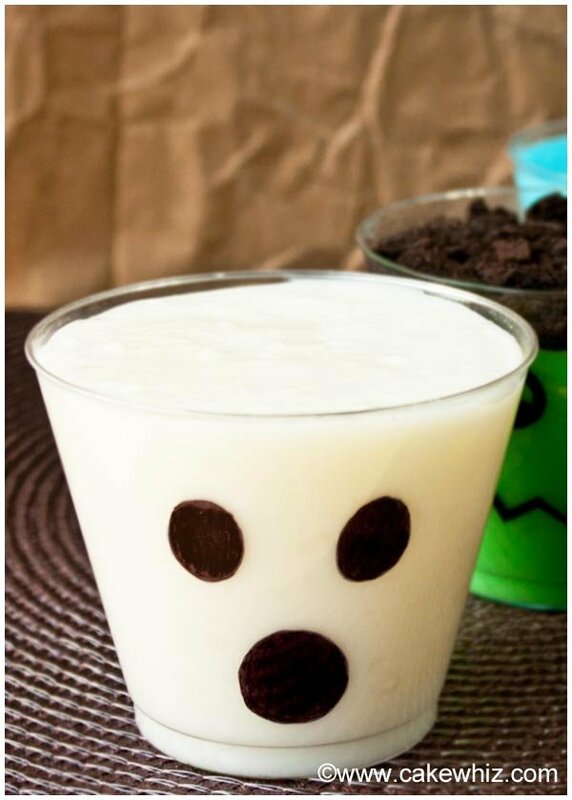 To make the ghost pudding cup, use a black sharpie marker to draw two ovals for the eyes and one big oval for the mouth on a plastic cup. Make vanilla pudding or use store-bought vanilla pudding. Taipioca pudding is a fun choice too. Divide the pudding into 4 portions. Use gel coloring to color one portion orange (Jack O'Lantern), another portion blue (Monster), another portion green (Frankenstein) and leave one pudding white (Ghost). Pour colored pudding into their relevant cups. Chill these in the refrigerator until you are ready to serve. 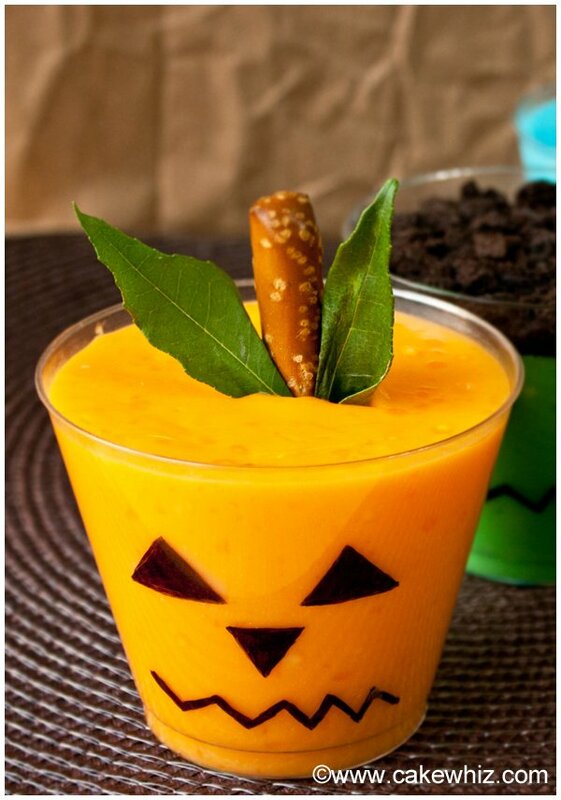 Then, push a pretzel rod into the Jack O'Lantern pudding cup and stick 2 curry leaves or mint leaves on the side of the pretzel rods. Sprinkle some crushed Oreos on top of the Frankenstein pudding cup. You now have 4 different puddings cups: A one-eyed monster, Frankenstein, Jack O'Lantern and a Ghost. Enjoy!